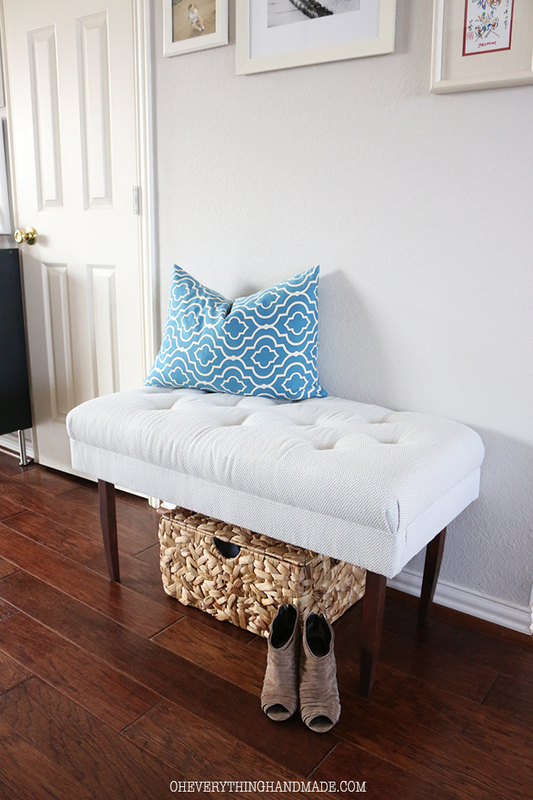 Most of entryways excluding the tiniest ones have a bench – this is a comfy piece to have a seat and put on your shoes, use it for storage and use the space under it for storage. 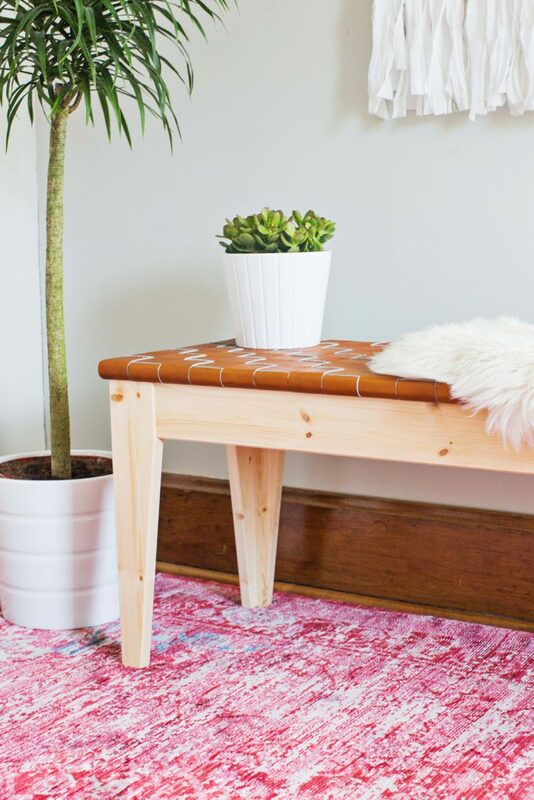 If you want one but aren’t ready to buy and feel crafty to make it, here’s a bunch of DIYs to make various benches of different materials – every DIYer will find something here! 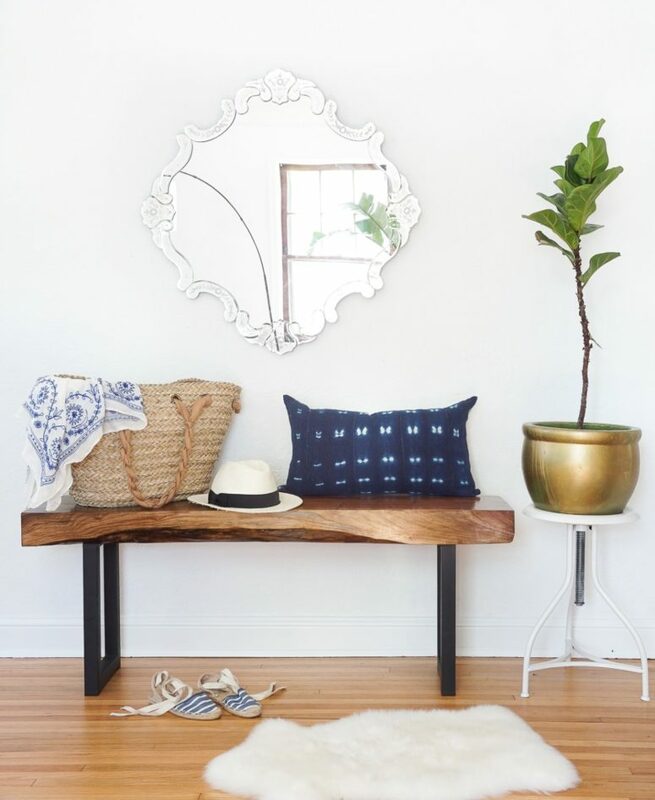 This isn’t a usual wooden bench, it’s an ideal piece for entryways! Why? Because it features shoe storage, which is organized in a non-boring and unusual way. Hanging storage baskets are exactly what you need to attach to the seat. 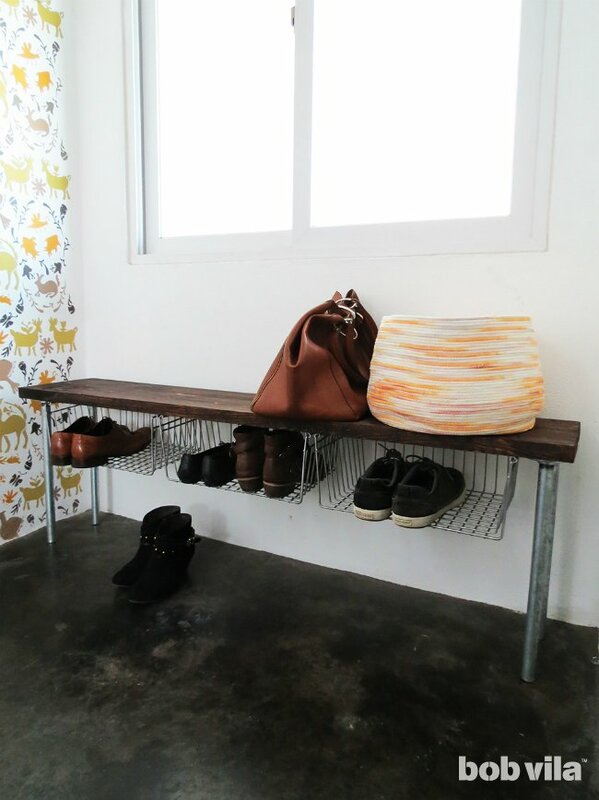 Read how to attach such baskets to a bench or how to DIY a bench first and then attach them. Enjoy crafting! Hairpin legs are a trendy solution in furniture design now, that’s why making a stylish bench with hairpin legs is a cool idea. This bench features a stained seat and hairpin legs and making it won’t take much time. 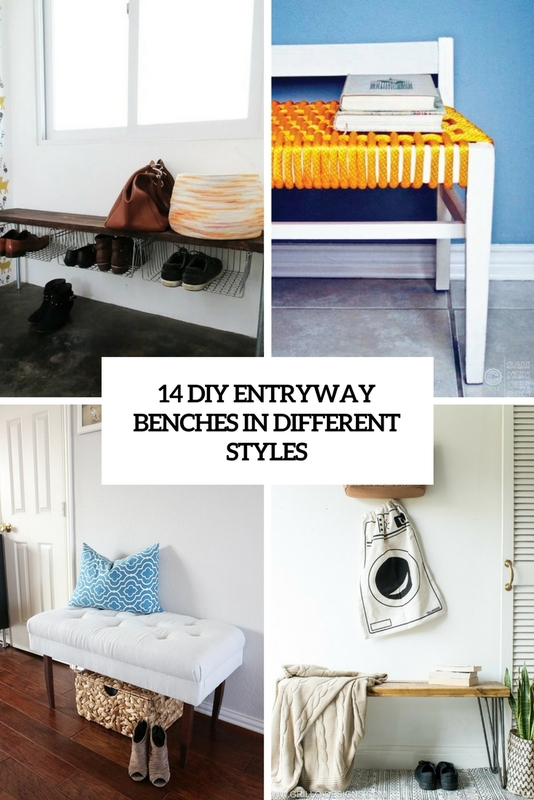 Read how to make it and spruce up your entryway with a trendy bench. Here’s another hairpin leg bench but it’s special: it features a rough wooden slab with a rough edge and uneven thickness. Such a bench will add a chic touch to your space and will make it cozier and warmer. The hairpin legs will add a trendy feel to the piece. 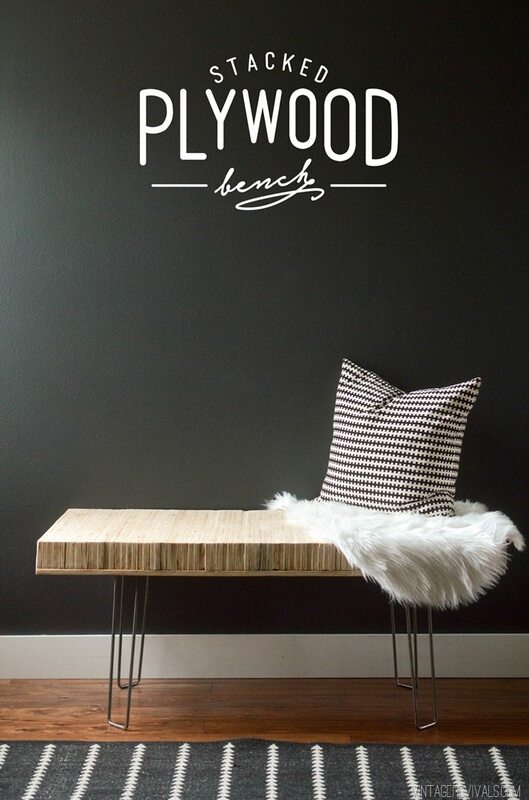 This simple modern wooden bench will fit many spaces from modern to even boho chic ones. It has a stained wooden seat and metal legs, every modern and stable ones, in black. The wood is walnut, which adds chic and style with its texture to the space. Enjoy! More hairpins? Yes, please! The bench features not only them but also a comfy seat made of stacked plywood? What’s the advantage in comparison to a wooden seat? Stacked plywood is much cheaper and you may already have some at hand from the previous projects or renovations. Read how to make the piece and happy crafting! This is not a furniture making project but a renovating one. 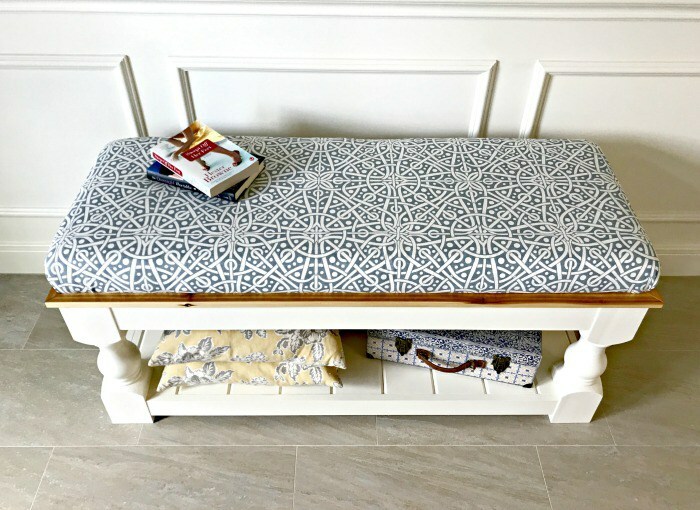 A cheap second-hand bench was renovated with stenciling: it’s a white bench with colorful touches here and there and there’s much storage inside. Make your space more colorful and vivacious with such a bench! 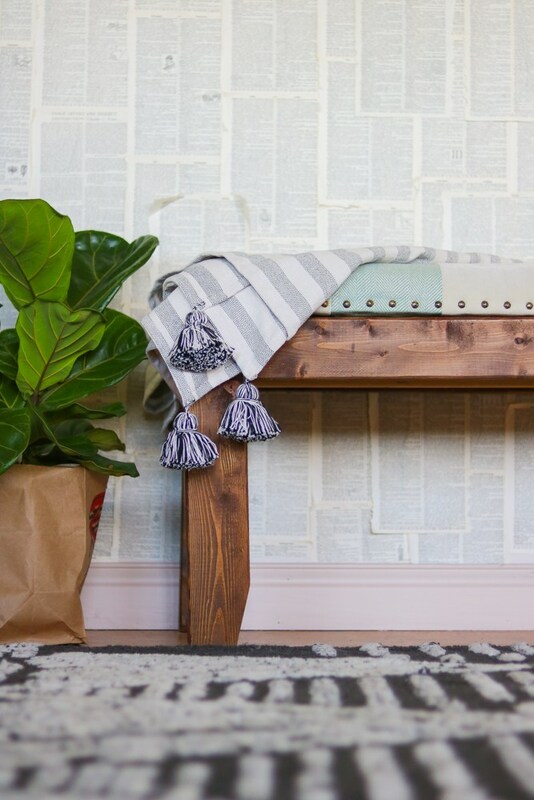 This beautiful vintage wooden bench features an open storage space and cool printed upholstery. Such a piece will be a perfect solution for a shabby chic or vintage space. The tutorial will tell you how to make the whole piece of wood and it will take some time but the result is very stylish and cool. 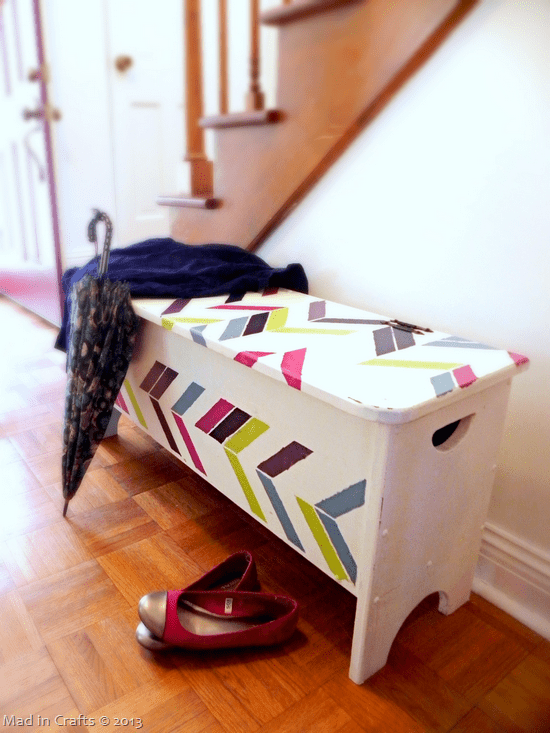 An old and boring farmhouse-style bench is turned into a chic and modern solution on taller legs – exactly what you need for your entryway! The seat is upholstered with printed blue fabric and is placed on taller legs, though there is no additional space storage, it looks cool and is comfy. 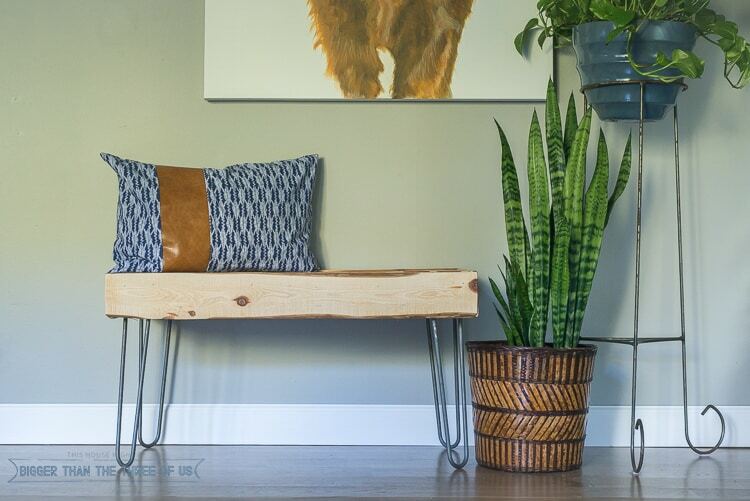 This rustic bench features a cool and chic shape and light-colored checked upholstery – the contrast is amazing! The edge is decorated with nail heads and the whole piece looks very comfy and cozy – ideal for a modern farmhouse entryway! Read how to make the whole piece from the beginning. 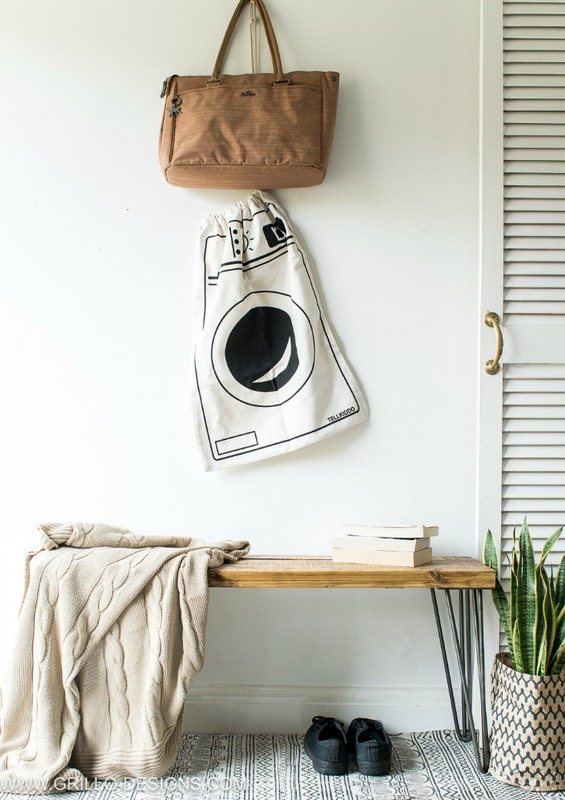 Everybody needs some additional storage in such a utility space as an entryway. Need some storage? Let’s go for it! This bench with much storage space is made of usual cabinets, there’s a cushion added on top for upholstery and some pillows. 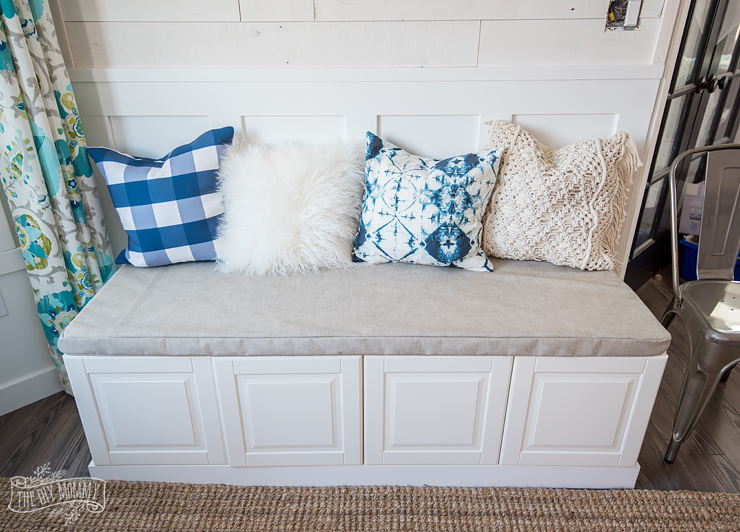 Watch the video tutorial to make the whole bench and get some storage! 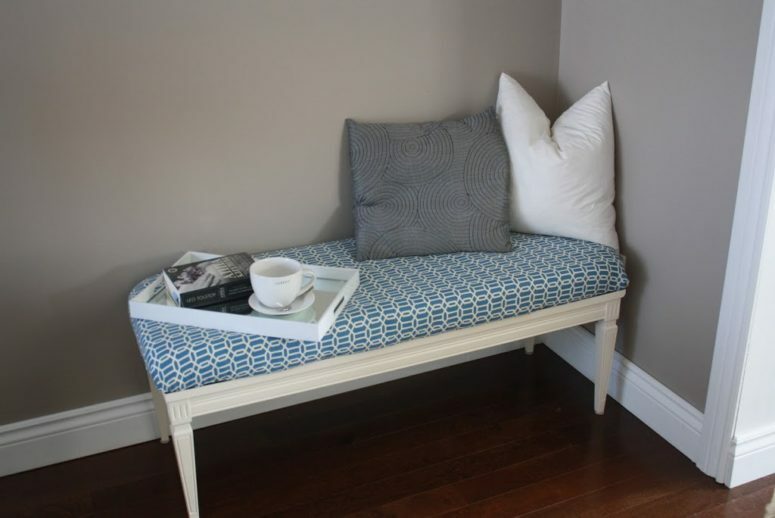 A vintage coffee table can be transformed into a comfy upholstered bench. Sand paper it, stain or paint it and go for attaching some upholstery or just cover the table with a comfy cushion. That’s it! Need some detailed instructions? Read them in the source. A small vintage desk got a renovation and the piece is turned into a comfy bench with upholstery. The idea is basically the same: sand papering, staining or painting but here the legs were also changed to give the bench a more fresh and modern look. Cut them off and substitute for newer ones! Read what to do next in the project. I’m totally head over heels about this bench! This piece is made from a usual IKEA bench and features a chic cognac-colored leather woven seat. Such a bench can fit a boho or a mid-century modern space, and I love the contrast between light-colored wood and rich-colored leather. Read how to weave the leather to form the seat. 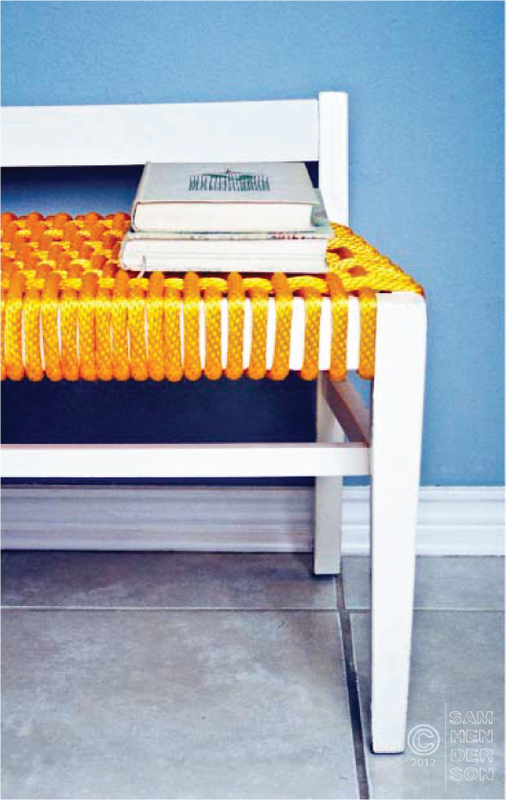 Enjoy this bright makeover of a usual vintage bench with some colorful rope! I strongly recommend to rock a white bench with some bold shade of rope to create visual interest. The good thing is that such a bench is cheaper than the previous idea with leather and more eco-friendly. The bench has a modern and lively look, I love it!